In 1990, Mark Harris, Kirk Sullivan, Andy Chrisman and Marty Magehee felt called to start another Chrisitan music group. So, they left the original band, THE TRUTH and started their music ministry, as 4Him, a Christian Pop music group which was greatly blessed by the Lord with success in the mainstream Christian Pop music industry. During these 8 years, 4Him made 7 original albums to the glory of Jesus Christ. They have won many awards, including 7 Dove awards. Their recogniton and success began in 1991, when they won a Dove Award for BEST NEW ARTIST. A near complete list of all their awards can be found at the bottom of their Discography page. It had been three years since their last studio release with original songs. Kirk Sullivan was led by the Holy Spirit to purchase a recording studio, as a witness to God's faithfulness, which he set up in Mobile, AL, where he has been working with local Christian artists and churches to produce their own Christian music CDs. He also developed stronger relationships with the people in a local church over the last 3 years, feeling like he now has a home in Mobile, Al. Mark Harris and Marty Magehee for the last three years had been enjoying married life and happily raising their children, immersing themselves into family life, putting their music ministry second. Andy Chrisman, when he wasn't traveling with the band, is full-time pastor and music worship leader at Celebrate Family church in Celebration, Florida. In 1998, Andy felt a strong calling to become a pastor, and after a two year wait, which "stretched the faith of Andy and his family", a pastor asked Andy to help start a church in Florida. During this time, the members of 4Him have been traveling down very different roads, gathering inspiration thourgh their own life walks with Jesus, for their next album, WALK ON. The experiences of living their faith in their every day Christian walk began to weave its way throughout the lyrics as they composed the new songs on this CD, which so beautifully expressed these four men's new journeys and lessons learned from life experiences in following the Lord in faith. Mark Heimerman and Brent Bourgeios produced this gem of an album. 4Him once again came together to create a new album, VISIBLE, which is a return to 4Him's roots with amazing harmonies and stellar vocals reminiscent of the sound that established them as Dove Award winners. With raw and honest lyrics that describe God's unconditional love for mankind and His sovereign power in our lives, this album is a must-have! "The songs on this record are some of the best that we have ever had the privilege to perform. They are from the heart, and I hope they mean as much to others as they do to us," says Mark Harris. For several years, the members 4Him have been friends with Jim Caveizel, who portrays Jesus in Mel Gibson's film, THE PASSION OF THE CHRIST. Marty MaGehee was able to accept an invitation to screen the film, and was actually able to visit Jim Caviezel on the set of this movie during its production in Italy. "I had the opportunity to go to Rome and visit the set with Jim while he was doing this project," says Marty. "Even though we've known him for 10 years, after the make up was applied, and the hair placed on his head on set, he was no longer Jim. I could tell that unlike his roles in the past, where it was easy to separate Jim from his characters, it was nearly impossible to find him at all in this role. My wife Sheri and I could tell that God had done an incredible work in Jim's life through this role." 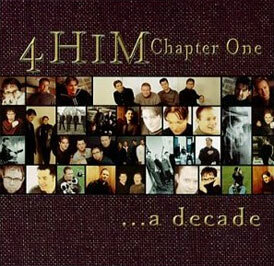 February 24, 2004 - 4Him traveled to Manila, in the Phillipeans where they performed a series of concerts in The Cathedral of Praise, which is a church of nearly 20,000 members in downtown Manila. The members of 4Him visited 17 years ago when they were still members of THE TRUTH.